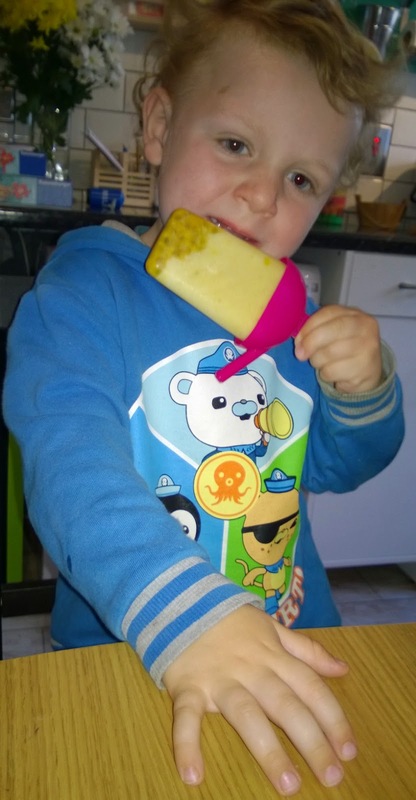 Ollie doesn't react well to artificial colours and sweeteners, and for the sake of both boys teeth and general health we try to limit refined sugars. One of the treats this therefore precludes is shop bought ice lollies. This year I saw lolly moulds in the supermarket and thought we'd give it a go. We have been making lollies with a high fruit content cordial or something refreshing like elderflower cordial watered down to at least the recommended dilution. Last week though I saw a leaflet in Sainsburies explaining how to make fruit lollies and it seemed really simple so we gave it a go.